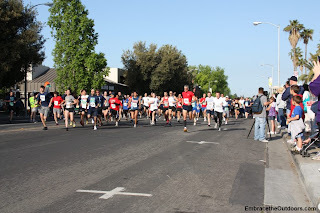 We went to the Great Spear-It Run today in Stockton. It was our first time doing this race. 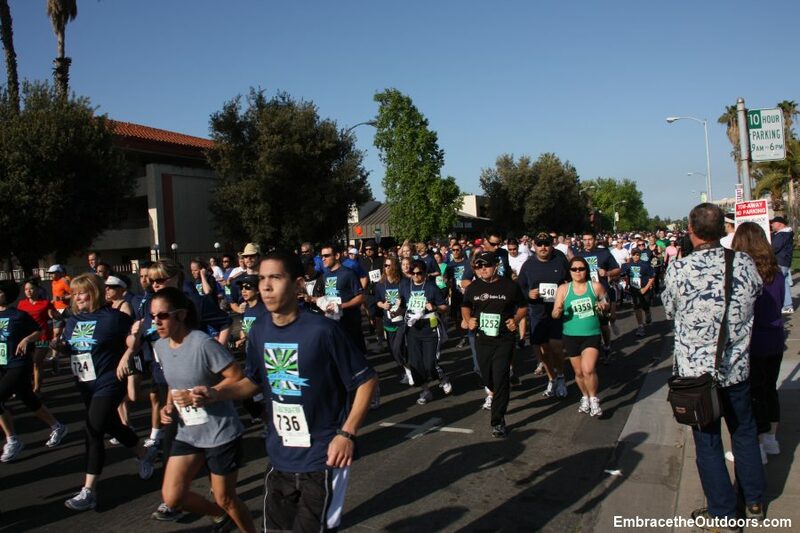 It included one mile, 5k and five mile races. 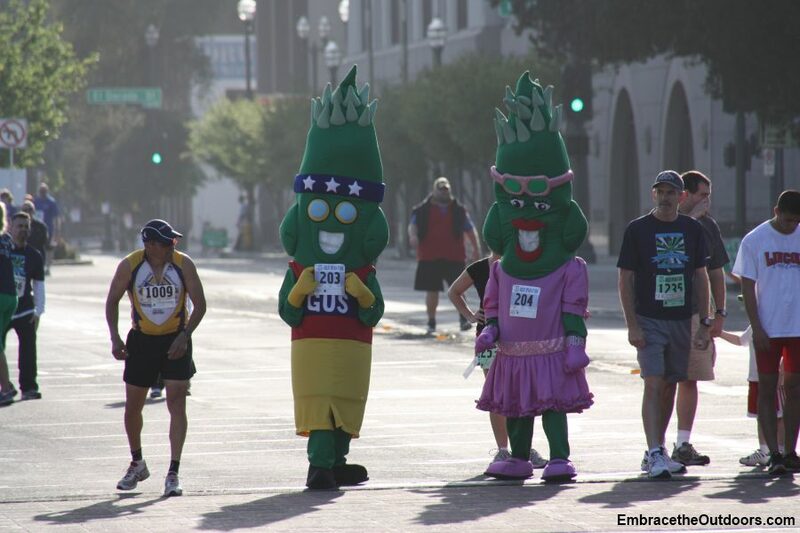 The run is part of the three day Annual Asparagus Festival. We registered for the five mile race and the entry fee included a performance t-shirt and admission to the festival. We always like the performance t-shirts over the cotton so we were excited about that. The drive to the race was straightforward and there was ample parking on the surrounding streets since it was early in the day. There were also many parking lots in the surrounding area that charged $10. Finding race day bib pick-up was easy so we had time to kill. The race application and event website all listed race start to be 8am but once we were there it was announced that the one mile race would start at 8am and the 5k and 5 mile races would not start until 8:30. The start time announcement seemed like news to everyone so we don't think we misread the event information beforehand. With an extra half hour to wait for our race we enjoyed the Mariachi Band that was performing and watched the local farmers set up for the local market. We also watched the 1 mile racers, many of them children. "Gus" the Asparagus participated as well. The course for all three races was similar, starting on Weber Avenue along the waterfront and ending at the finish line inside the festival. The 5k and 5 mile races included several turnarounds on Weber Avenue which proved to be good and bad. The numerous turnarounds on the 5 mile course definitely affected our momentum but also gave us ample opportunities to see our spectators, something that we haven't seen in other races we've done. 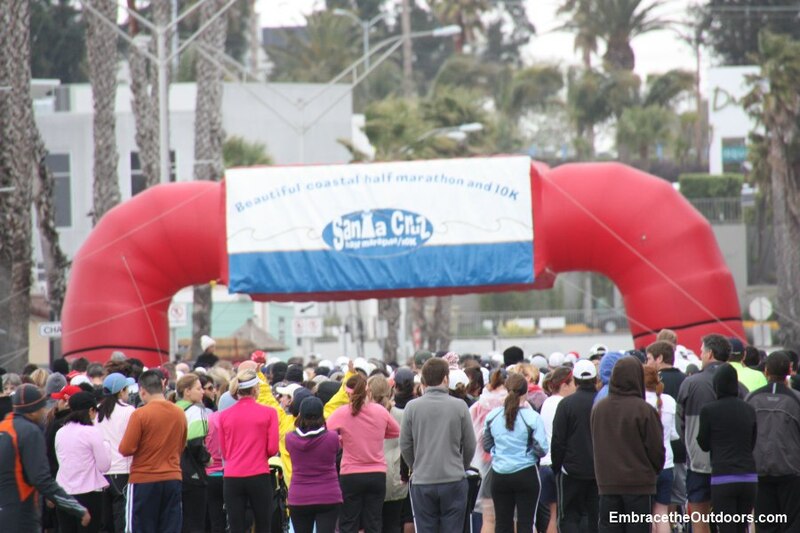 Because the 5k and 5mile races used the same course it did get confusing to race volunteers and racers alike whether they had completed all of the turnarounds before heading towards the finish line. 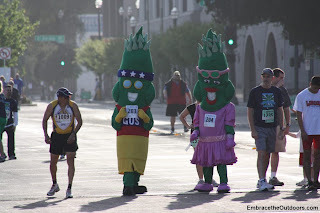 Once we had completed all of our turnarounds we headed to the finish line inside the Asparagus Festival and soon noticed that the finish line was set up too soon in our course. We ended the race at 4.5 miles and not 5miles, which was disappointing. Besides the incorrect distance on the 5 mile course we did notice a few other things that could be improved upon before next year, the water stations and the mile markers. There were two water stations set up but only one was functional and there were only two mile markers, one at the 1 mile mark and one at the 2 mile mark. 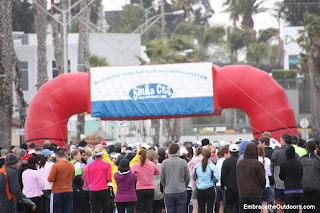 There were about 1000 race participants in total and the weather could not have been better. We did not stay for the Asparagus Festival after the race since it didn't start for about another 45 minutes or so and we had other plans for the day. We did make a quick stop at the conveniently located farmers market on our way out. 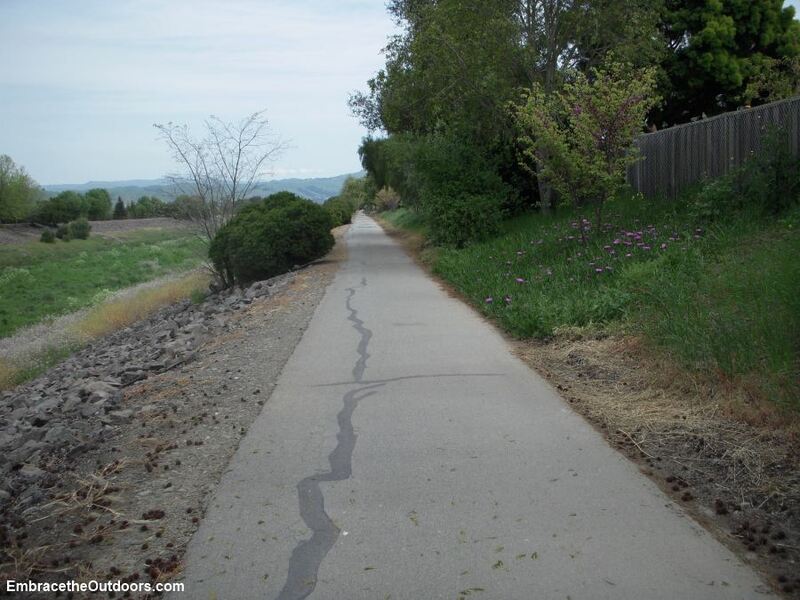 With the EBRPD Trails Challenge in mind, we headed out for a bike ride along the Alameda Creek Trail. 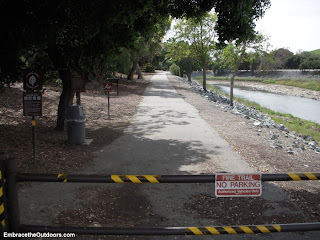 This paved trail follows the creek from Niles Canyon to the San Francisco Bay, passing several staging areas along the way. We drove to Coyote Hills Regional Park in Fremont and started our ride at the Bayview Trail near the parks main parking lot. We stayed on the breezy trail for about 0.75mile before it connected to Alameda Creek Trail. Near this junction we were fortunate to be surrounded by many grazing sheep. They were all around us and were not shy. There were bicyclists, walkers and runners all stopped here admiring the sheep and snapping pictures. After we took our share of pictures we continued on the trail. There are mile markers every quarter mile for those who may not want to do the entire trail. On the first half of our ride the weather was warm with just a slight breeze, a perfect day for the ride. There were runners, walkers, bicyclists and a few people on roller blades enjoying the trail. After about an hour we arrived at Niles Canyon where we took a break and more pictures. 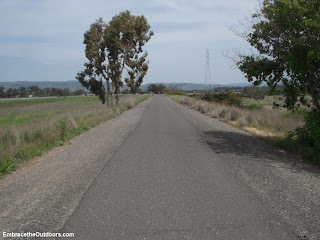 We made our way back towards Coyote Hills. About 5 miles into the ride back the wind really starting kicking up and making us work for our progress. 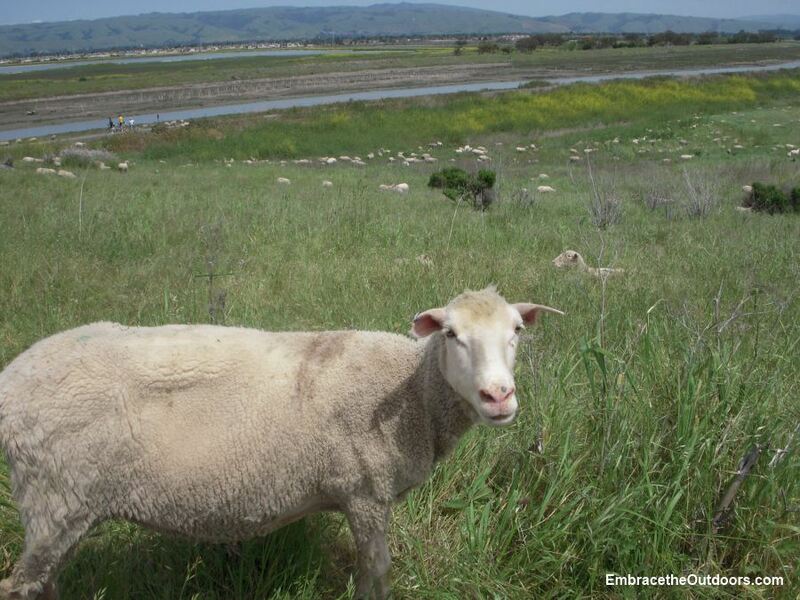 As we made it back to Coyote Hills we could feel the air beginning to cool. More tired than anticipated, we were glad when we made it back to our car after about 2and a half hours and a 20 mile ride. The trail proved to be good for a leisurely bike ride (when it is wind-free) and would work well for a run as well. Its not the most scenic ride you'll ever take but it was great being able to travel 10 miles in one direction on a paved path and never have to cross traffic. 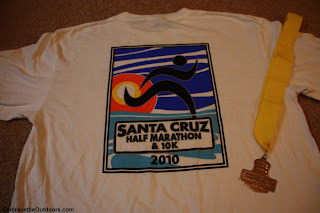 We ran the Santa Cruz Half Marathon for the first time today, along with 2199 other runners. There was also a 10k race with 1114 runners. We had read about the great views on the race so decided to do it. The views did not disappoint but the weather did. 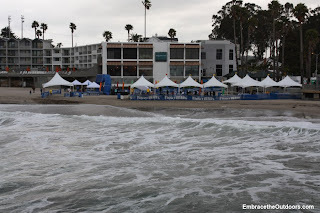 We knew a few days before that the weather was going to be bad but we decided to make it a weekend trip anyway, spending the day before the race at the Santa Cruz Beach Boardwalk. The race start was only a few short blocks from the Boardwalk itself so the morning of race day parking proved to be a challenge. Once at the start we could feel the cold breeze but were grateful that it was not raining. The course started out on a street along the coast and there was room for us to spread out but after a couple of miles it quickly narrowed and stayed that way for most of the course. The course had only a few hills and was mainly an out and back route with one loop in Wilder Ranch State Park. Once in Wilder Ranch the paved road was replaced by gravel and dirt and we had to be careful not to twist an ankle. The dirt path through the park was the narrowest part of the course making it difficult to pass other runners. We could definitely feel the wind while in the park but the views were still spectacular. 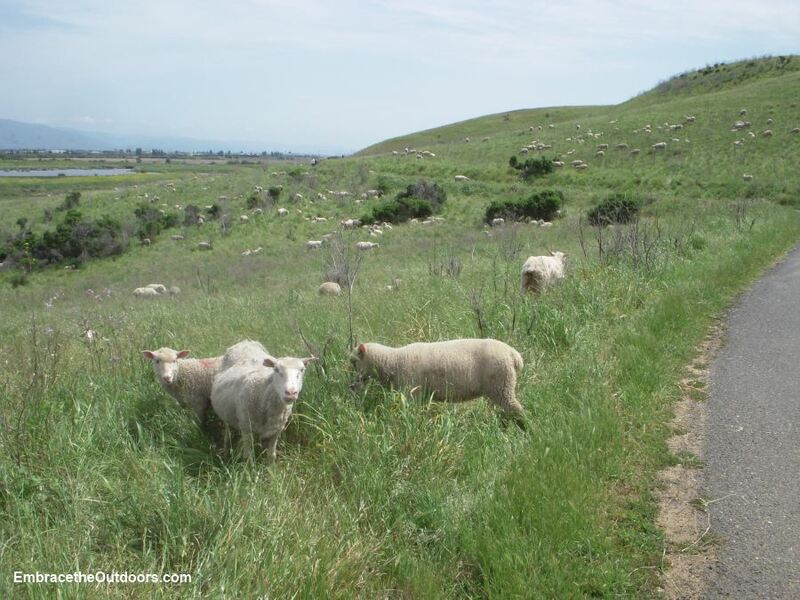 Once out of Wilder Ranch we re-traced our steps back towards the Boardwalk. The course continued to be narrow all the way to the finish, since the street that had originally been closed for the race was now open to car traffic. Nearly two hours into the race it began to rain lightly and the wind began to pick up. Thankful to be near the finish we picked up our pace. The finish seemed very abrupt as we made a sharp right turn only a few steps from the finish line which is on the beach itself. Having the finish line on the beach is nice in theory but caused us to get sand in our shoes and socks and had us questioning whether it was really the best location for the finish. Once at the finish we received our medals and then picked up our t-shirts since they were not handed out prior to the race. This race t-shirt is probably our favorite race shirt to date since there are no sponsors on the shirt. There were also plenty of the usual post-race snacks on the beach. Despite the weather, the narrow course and the sand-filled finish, it was a great race and we would do it again.